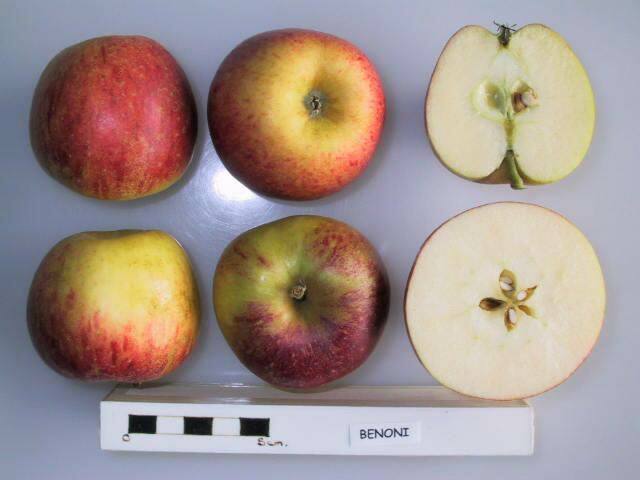 Benoni is a pleasant early or mid-season heritage apple from Massachusetts, USA, ripening in late August in most areas where it is grown. 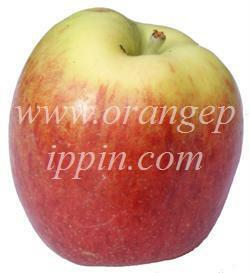 It has an attractive yellow skin predominantly (sometimes entirely) covered with a red / orange flush. The flesh is light, fairly soft, and with a mild sweet flavor. The skin is noticeably greasy, and the apples do not keep. Benoni comes into bearing at a young age and crops well, but has a tendency to over-crop and then lapses into biennial bearing - cropping every alternate year. This can sometimes be corrected by heavily thinning the crop in late spring of the "on" year, thereby preventing the tree exhausting itself and allowing fruit buds to develop for the following year. Benoni was introduced to the UK by the famous Rivers of Sawbridgeworth nursery in the late 19th century. Mr Rivers took the sensible step of sending samples to the noted fruit enthusiast Robert Hogg, who included an entry for it in his influential book "The Fruit Manual", and described it as "a delicious dessert apple". Although not widely grown in the UK, Benoni's muted orange-flushed skin gives it the appearance of a typical English apple.